Following diagram depicts high level component architecture of accelQ deployment. Check your specific deployment instance to identify following folders. 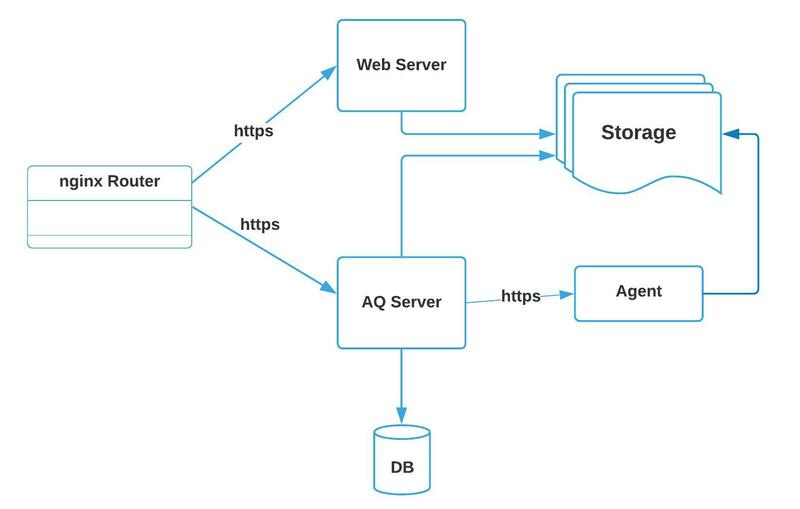 Folder where accelQ app server and web server are deployed. Scripts to start/stop application services are available here. Take a copy when deploying new release or a patch. Database Home location of db installation. All the test assets are stored as db repository here. Back up once an hour is recommended. Consult with your DB admin for setting this up, including incremental vs. full backup options. Folder where the agent is deployed. Scripts to start/stop agent are available here. Take a copy during new deployments and patch updates. Storage Results and test jobs are stored here. Test screenshots are stored here, while the reports are available in the database. Depending on risk tolerance, once or twice a day backup is sufficient. All the services below, are set to auto-start upon restart of the server. You can stop/re-start these services from Services tab of the Task Manager. Login to accelQ and delete old results from Results grid. You have an option to purge results older than given date. Delete old, archived server log files from time to time. Refer to the folders section to identify various log folders.